November 19, 2018, 2:13 p.m. The history of pop music has been characterised by high-profile rivals battling for chart supremacy. Now, fresh data from newly-launched popularity tracking tool YouGov Ratings reveals which member of famous musical rivalries the public prefers. YouGov Ratings measures the popularity and fame of anything and everything, from Conservative politicians to folk singers, chocolate bars and football clubs, based on millions of responses from the British public. One of rock music’s classic debates is which is the better band, The Beatles or The Rolling Stones? 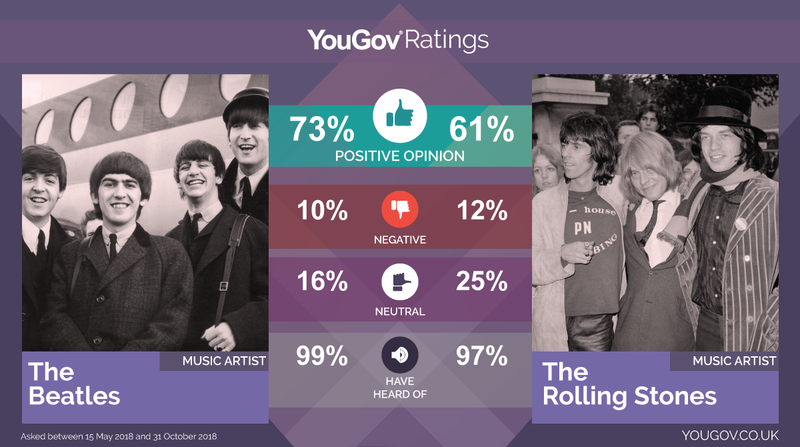 While both are much-loved by the British public, our Ratings data indicates that John, Paul, George and Ringo have a higher score (a positivity rating of 73%) than the Stones (61%). In Britpop’s mid-90s heyday, there was an infamous battle for the number 1 spot between Blur’s ‘Country House’ and Oasis’s ‘Roll With It’. While the Damon Albarn fronted Blur won out on that particular occasion, YouGov Ratings data shows that Manchester’s Oasis are more popular with the public, narrowly edging out their rivals by 6% (53% vs. 47%). However, things have turned sour between the Gallagher brothers since Oasis’s split in 2009, with Liam and Noel often warring in the press. Our data shows that the older brother Noel, narrowly edges out frontman Liam in terms of popularity, 37% vs. 35%. The Gallaghers are not the only former bandmates to have a subsequent musical rivalry. For a time after Take That disbanded, Gary Barlow’s career stalled while Robbie Williams became a star in his own right. While the two have since reunited, our data shows that the Angles singer remains the most popular, with a score of 56% against Gary’s 52%. Looking further back in musical history to the 80s, Prince and Michael Jackson dominated the charts around the world as they reached their creative peaks. 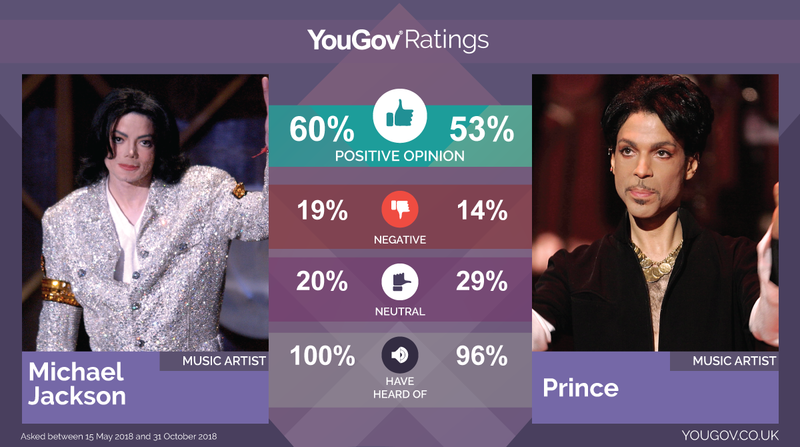 Both have strong scores according to YouGov ratings, with the proclaimed ‘King of Pop’ beating the Purple Rain singer 60% to 53%. In the late 90s and early 2000s, the pop landscape was ruled by Britney Spears and Christina Aguilera. And while the duo had a string of mega-hits, it is Aguilera that is ahead of Spears for one more time, with a score of 47% against Britney’s 37%.